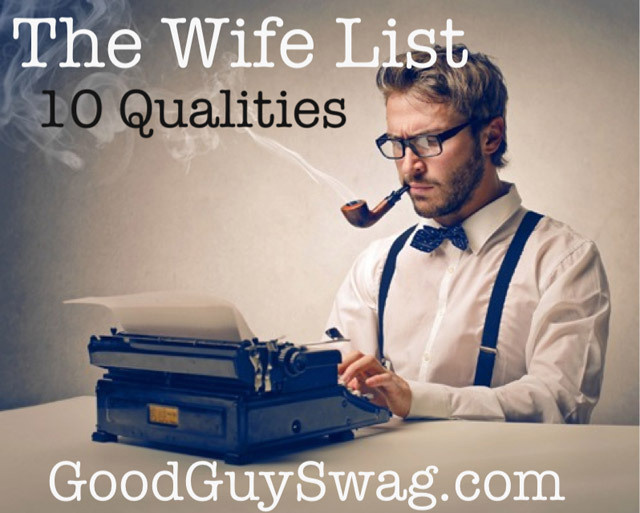 Recently, my wife posted The Husband List: 12 Non-Negotiables, which has received many comments from readers wondering what the wife list looks like. Well, I can sum up most of my friends’ lists right here: 1. Blonde, 2. Skinny, 3. Hot. A few others might include: she likes football, she drinks beer with my buds, and she’s at least a full C. No matter what I write below, that list isn’t going away for some of you guys. We’re all stubborn, but we can also be authentic. Sometimes we have to learn the hard way. Earlier this week, I wrote the article An Uncrafty Guy’s Guide to Making a Vision Board about keeping you visually focused on your dreams. Should we be specific about the woman we want to marry? Absolutely. However, make a list with long-term vision. Most of the characteristics we think we want in a wife aren’t ones that make for a good, lifelong relationship. They are characteristics of a woman we want for one night. When it comes to finding your wife, I’ve heard “equally yoked.” It has nothing to do with weightlifting for those of you guys who like muscle women. Your potential wife should have the same beliefs you have. Now, you may think you can do some missionary dating, and turn that situation around so she will believe everything you do. You’re probably going to be very disappointed with some bad side effects. If you don’t have the same core beliefs….good luck. If everyday is hell with her, that should be a red flag. Your potential wife should elevate you to Yourself 2.0. You can get a good idea from your friends and family. Do they say you act differently in a bad way when you are around her? Not a good sign. She should bring out the best in you, not bring out heartache and frayed nerves. In fact, she should inspire trustworthiness within you. If you don’t trust her, you’re probably making her as bitter as you’re making yourself. Not worth it. If you can’t trust her, maybe you’re not ready to date her or maybe you need to work on confidence issues within yourself. If there’s good reason not to trust her, don’t even go there. Just like any cheater, it’s bound to happen again. She should have strength in character and carry herself with confidence. As a man, you should be the leader in the relationship, but for any dictators who feel justified here; we’re talking servant leadership. You probably don’t want the consummate follower either. She should have plans too. In fact, she should be a hard worker just like you. That doesn’t mean having a job is a requirement. One of my friends is a stay-at-home wife with three kids, and she works harder than any of my friends with careers. She should care about others. Look at the way she treats her family and her friends. If she’s not close with her family, and doesn’t have any good friends, that’s not a good sign. If you start dating her, much less marry her, you will discover why soon enough. Some questions to ask yourself: Does she care about causes? Does she go out and volunteer? Does she give change to the needy or buy them a meal? These are important characteristics to consider. In your eyes, she should be a “10.” When my wife walks in the room, I’m awestruck by her every time. She’s beautiful from the inside out. However, I’ve dated “hot” girls who ended up being downright ugly by the time we broke up. Personality plays into attractiveness big-time. Just remember, “charm is deceptive and beauty is fleeting.” She should be beautiful down to her soul because that kind of beauty lasts forever. You’re going to be spending a lot of time with her, so she should be able to hold a good conversation. She should be wise, smart, and give you good advice. Her women’s intuition should be strong. I look to my wife all the time for advice. She’s collected all sorts of wisdom from her mom. She remembers everything. Yes, everything….maybe too much. If she’s trying to change you to be another person, it’s time to move on. Your future wife should love you just as you are, regardless of anything you’ve done in your past. There will be minor adjustments along the way, but if she nags you about your core characteristics, it won’t get any better in marriage. Does she remember appointments and meetings? Does she flake all of the time? She should already do a good job of managing her own life. If she’s got loads of debt and doesn’t work, you’re going to be taking all of that on. Ultimately, she will have some part in your financial well-being, and guess what? Finances remain one of the leading causes of divorce. If she doesn’t even try to connect with your family and/or friends, let her go. She shouldn’t be critical of the people who you love and have been loyal to you throughout your life. There might be cases where your mom doesn’t like your future wife, and that may require your intervention; but in general, she should be a good fit with the people in your life. Marriage is a joining of two lives that existed prior to meeting the other person. When it comes down to it, you know what you can handle. Love can overwrite any of the qualities above, but having these qualities will certainly make your lives easier once you are married. No one’s perfect. Even with this list, both of you are still going to bring some kind of baggage into the relationship. Make sure premarital counseling is a huge priority once you find her. My wife and I did a relationship bootcamp in addition to premarital counseling. One session just doesn’t cut it. Throw everything but the kitchen sink at the most important decision you will ever make.